African textiles are more than just pieces of clothing. Today African textiles are being collected as pieces of art In the past however they were made not only for fashion but also to satisfy and provide pleasure for the wearer. The types of fabric and their use differ depending on the region and country in which they are made. In Islamic areas, they tend to wear a lot of clothes, big flowing boubous with pants and tunics for the men, and equally large dresses for the women. The men usually cover their heads with caps or turbans. The Akan tribes of Ghana and Ivory Coast used silk to make fabrics for kings and high ranking officials. Other forms of fabrics used included cotton and raffia which were less expensive and readily available. In other areas like Zaire, the Mangbetu women wore woven leaf buttock screens, which as the name indicates were used to cover their waist area. When it comes to the production process, the equipment used, even by todays' standard, is very primitive. Wood is used to make the looms and only the pulleys are decorated. The fabrics are usually colored with plant dyes or given mud baths to take on certain colors. They are then soaked in large calabashes and sewed with needles and small knives. 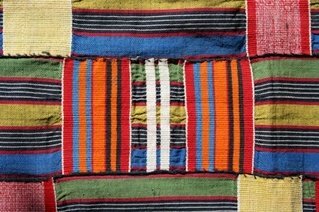 Even though the techniques used to make them are old and slow, African fabrics are remarkably beautiful and colorful. Everything is handmade and each complete piece of fabric is a living testament to the amount of time, effort, patience and care given to its production. Fabrics of various designs, colors and texture are worn all over the continent. This is especially noticeable during public feasts, where clothing is combined with jewelry to show the prestige, wealth and power of the dignitaries and those who want to stand out from the crowd.